DAWN has just broken in the normally sleepy resort town of Victoria Falls. But today is different. It is the day of the Econet Victoria Falls Marathon, and the main street has been transformed into a river of vibrant colour, energy and chatter. The full marathon runners have already gone, and the air is electric with excitement, nerves and anticipation as nearly 1,000 half marathon runners hope that the weeks spent pounding pavements in preparation for this event will finally pay off. 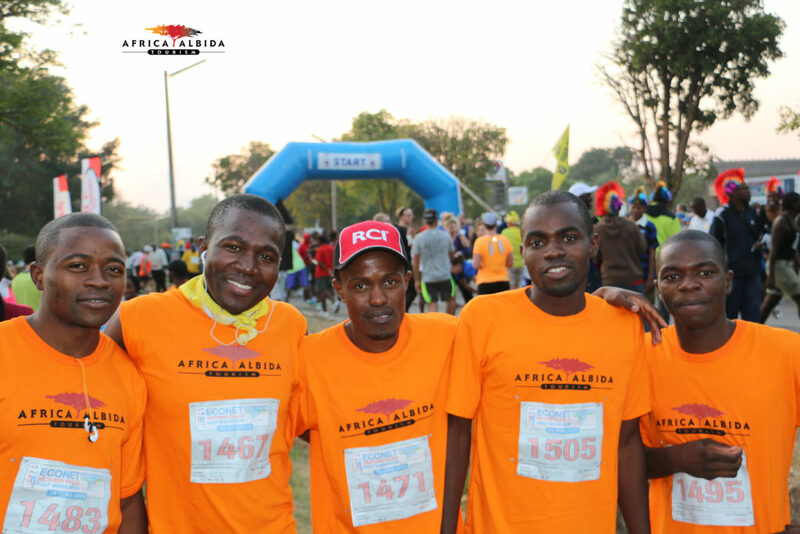 The Africa Albida Tourism (AAT) team are immediately noticeable, firstly for their branded bright orange t-shirts, and secondly because of their sheer numbers – 66 staff are taking part in the event, including 50 in the half marathon. The event also incorporates a 7km fun run. The staff work at the Victoria Falls Safari Lodge, Victoria Falls Safari Club, Victoria Falls Safari Suites, The Boma – Place of Eating and Lokuthula Lodges, and everybody is giving it a go – gardeners, chefs and even group chairman Dave Glynn. 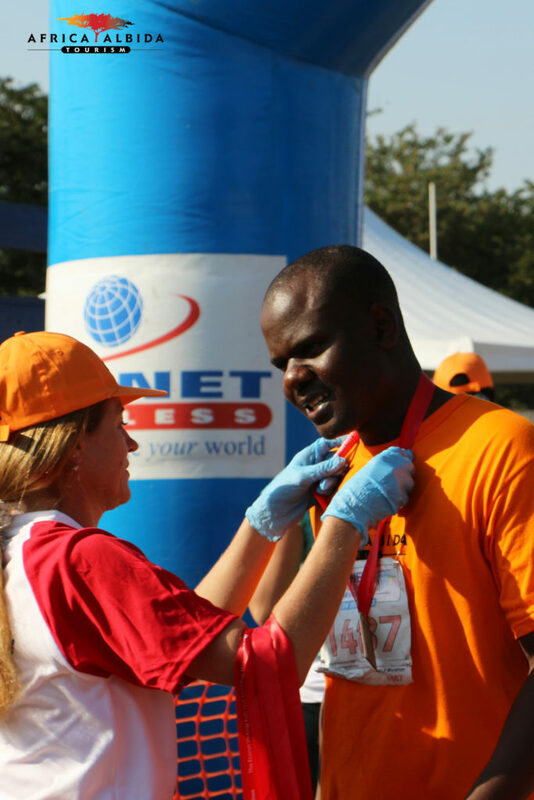 Banter abounds on whether Casper Mpofu, a bedroom hand at Victoria Falls Safari Lodge, will retain his title as AAT’s fastest runner after he completed the previous year’s half marathon in a tidy 1 hour 29 minutes. He good-naturedly boasts that he will. Casper was awarded the inaugural trophy, donated by Victoria Falls Safari Lodge regular guest and runner Ian Wallace, who has, again, this year, travelled from his home in Cape Town to take part in the event. I am part of the AAT team, and like everyone else, hoping for a good run. This is my seventh half marathon, and, naturally, I’d love to better my personal best time of 1 hr 51 min, but having only run relatively flat courses at sea level, this could just be a big ask. Most of the crowd appear to be Zimbabwean but there is also a fair sprinkling of international competitors, with some wearing t-shirts with the name of their country emblazoned across it- “South Africa”, “Kenya” and “Australia”. But others prefer to go more incognito, like a young German woman, who is doing volunteer work in South Africa, but came up to Victoria Falls for a holiday, and when she discovered it coincided with the event, she decided to enter. It turns out more than 100 South Africans have entered the event, more than 60 Americans, and plenty from neighbouring countries, including more than 50 from Zambia, and some from as far afield as New Zealand, Japan and Israel. As 7.15am nears, the crowds gravitate towards the start line, and then the race begins. It starts, encouragingly, downhill, and across the historic Victoria Falls bridge to Zambia. But before many of us have even crossed the bridge the “elite” runners – a tight and fast moving group of slightly built men – have already reached Zambia, turned around and are on their way back. 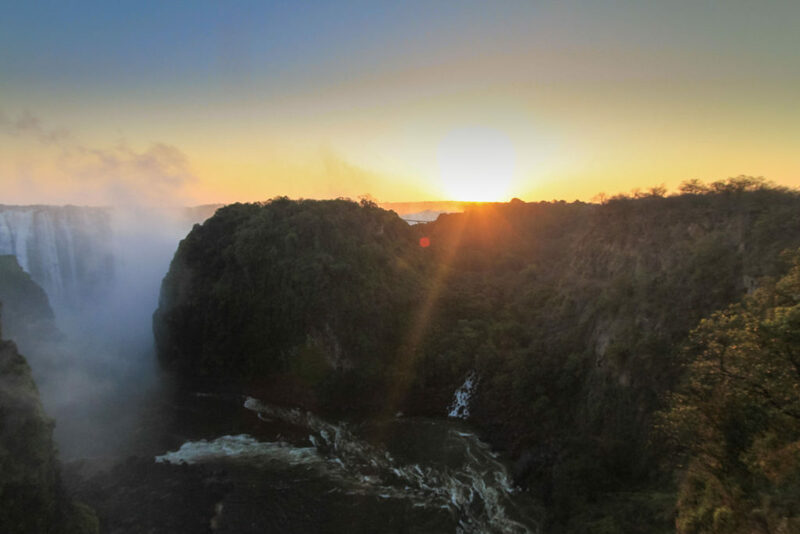 From the bridge, Victoria Falls is particularly breathtakingly beautiful in the early morning light, and as the sun rises above it, many runners pause to take in this memorable view, before running on to the Zambian border and u-turning under the gaze of a watchful customs official. 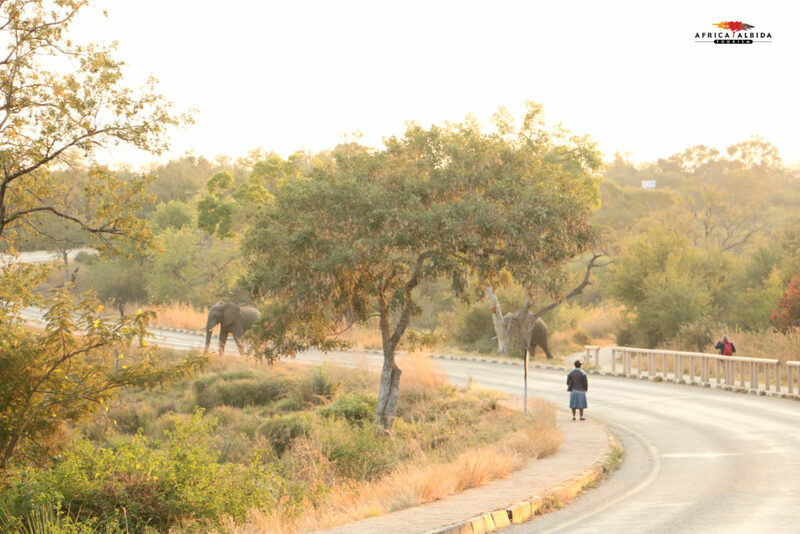 Back over the bridge and into Zambezi Drive, and Zambezi National Park, suddenly I am aware elephants are nearby … big, wild African ones. There are very fresh elephant droppings on the road, then the sound of trumpeting comes from the bush. Armed National Parks staff are on high alert. I later learn an earlier group of runners had been charged by an elephant. I don’t imagine there are too many other marathons where runners can squeeze in a bit of game viewing, and one of the Seven Natural Wonders of the World. Next runners are rewarded with a glimpse of the mighty Zambezi River before it cascades more than 100m into a gorge, to form the world’s largest waterfall, and then on through the national park, where monkeys and baboons dot the road here and there. So far temperatures are cool and there’s enough downhill to keep runners happy. But that’s all about to change. At the 14km mark, just before Victoria Falls Safari Lodge, the torment starts to creep in, as the road winds gradually at first, and then more steeply uphill, forcing many to slow to a “granny” run or a walk. 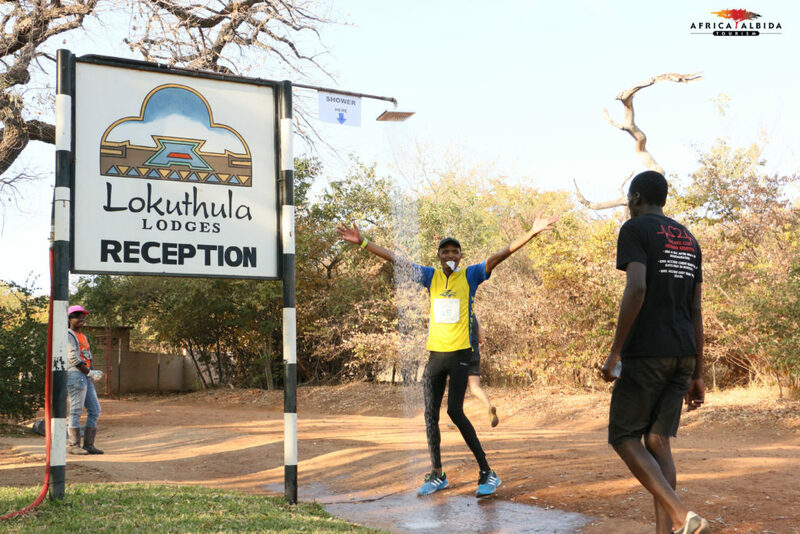 After what seems like forever running uphill, runners enter the gates of Victoria Falls Safari Lodge, expecting it to end there. But it doesn’t. The hill keeps going. Fitness is put to the ultimate test. The only welcome sight is a cool shower for participants to run through at the AAT water stand. Eventually, runners reach a t-junction, and those with a bit of “go” left in them try to capitalise on a welcome, but short-lived, stretch of downhill. Then comes the final leg … more uphill, and as temperatures rise many a sweat-drenched runner’s pace now slows to a walk, sometimes returning to a lack lustre run, after being prompted by words of encouragement by passing runners or a warm Zimbabwean smile from the sidelines. The last in a series of cruel final twists comes when just as the end seems imminent, now weary runners are made to run around the perimeter of a very, very large sports field at Victoria Falls Primary School before crossing the finish line, where they are greeted with medals, t-shirts and cold bottles of water. I finish in 2 hours, 2 minutes and 10 seconds, making it one of my slower times, but the hills definitely made it the toughest half marathon I have done. However, it is a challenge worth rising to, and an experience that won’t easily be forgotten. The race was won by 25-year-old Zimbabwean Munjaradz Jari in 1 hr 5 min 45 sec, whilst the fastest woman to cross the finish line was 25-year-old Zimbabwean Constance Nyasange in 1 hr 17 min 14 sec. Full marathon competitors had to complete two of these 21.1km circuits, with 34 -year-old Zimbabwean Nkosiyazi Sibanda crossing the finish line first in a time of 2 hr 19 min 12 sec, making it, incredibly, his fourth consecutive win at this event. The fastest woman, Zimbabwean, Thabitha Tsatsa, 36, covered 42.2km in an impressive 2 hr 49 min 44 sec. But what happened to Casper Mpofu, the humble, but nimble-footed, bedroom hand from Victoria Falls Safari Lodge? Well, unfortunately, he didn’t retain his title as fastest man at AAT, taking second place to Ronald Tshuma, a chef in the Victoria Falls Safari Lodge’ MaKuwa-Kuwa Restaurant kitchen, who ran the race in 1 hr 29 min 20 sec. Casper came second, while Jaya Mapfumo, a bedroom hand at Lokuthula Lodges, came third, and for the record, the boss, Dave Glynn, finished in a time of 2 hr 28 min 27 sec. Don’t worry, Casper, there’s always next year!